Free and easy brush painting for kids – art and craft ideas for kids using paint. Fun and safe painting ideas that are suitable for preschool kids and for toddler crafts. 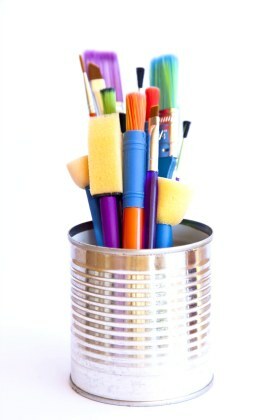 These ideas are a source of inspiration for fun craft ideas for kids using paint. Choose and adapt these ideas to suit your child and their interests, abilities and level of skill. Add a small amount of water to the bucket. 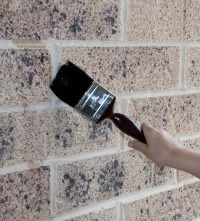 Let your child paint the outside of your house, the fence, the side walk, stairs, concrete, trees or whatever else they like. Place the piece of material on the carpet and have your child lay on top of it. Draw the outline of your child using the marker. 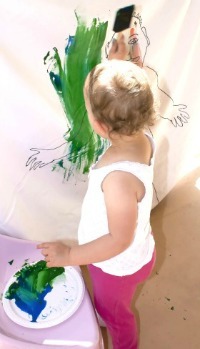 Let your child paint themselves…..that is their body outline on the material. Place the piece of paper on the floor. 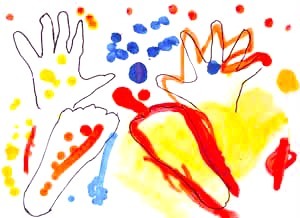 Draw the outline of your child’s hands and feet using the marker. Let your child paint their hand and feet outlines.